Salary Persons how to Filing Form 10E Benefits FY 2018-19. Income tax Form-10E and Section 89(1) details download in Telugu. 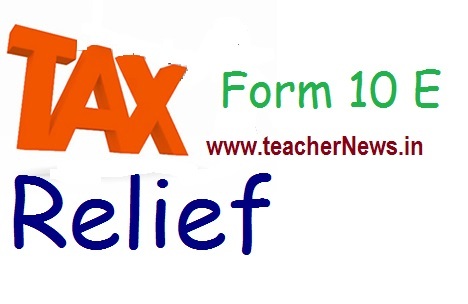 Income Tax relief calculation for 10E form in Income Tax 2018-19. How to Calculate Arrears Claim Relief under Section 89(1) FY 2018-19. AP Employees How to claim tax relief under Section 89 for salary arrears? TS Teachers How to calculate Arrears Relief Calculation U/s 89(1) with Automated Arrears Calculator with Form 10E Since FY 2014-15, FY 2015-16, FY 2016-17 and FY 2017-18. AP Teachers/ Employees Arrears how to Calculate in Form 10E - IT Section 89(1) Official Clarification 2018-19. Employees Arrears how to Calculate in Form 10E - IT Section 89(1) Official Clarification 2018-19. Arrears from FY 2014-15, FY 2015-16, FY 2016-17 and FY 2017-18.